Groomers Best 58" ADA Elite PetTub w/Steps, Faucet, Grate, Bottle Holder. Pkg Deal! 01. Groomers Best 58" ADA Walk-thru Tub w/Clip Ramp, Faucet, Grate, Bottle Holder. Pkg Deal! 02. Groomers Best 58" ADA Walk-thru Tub w/Pull Ramp. Faucet, Grate, Bottle Holder. Pkg Deal! 04. Groomers Best 58" ADA Elite PetTub w/Steps, Faucet, Grate, Bottle Holder. Pkg Deal! 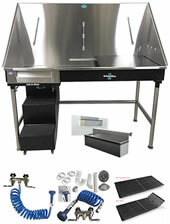 Ask a question about the: Groomers Best 58" ADA Elite PetTub w/Steps, Faucet, Grate, Bottle Holder. Pkg Deal! Groomers Best 58" Elite ADA Bathing Station w/Faucet, Grate, Hottle Holder, Toy Rack - Package Deal! Get the bather and all accessories in this package deal and save! Just install your plumbing to this bath and your ready to start bathing your dogs. Solid stainless steel tub will last a lifetime. Hot/cold water ports & drain hole available on right or left side. The walk through design with pull out pull out steps makes transporting animal into the tub much easier on groomers and pets. Pull steps out to use and push in under the pet bath while bathing animals. The steps front bottom has casters which makes it very easy to maneuver, no bending down to move the step out of your way. Made of 18 gauge 304 stainless steel for durability, and will never rust! Strong, durable and versatile. High back and sides protect against splashed and shaken water. 5” deep with tall legs to enable wheelchair access to the tub. Low faucet and sprayer for an easy reach, along with grooming loop restraints on the inside back and front wall for easy access. Includes a Lift & Slide step that allows for the animals ease of access and tucks away underneath the tub when not in use. Imagine yourself standing, facing the front of the tub. Your right hand will be on the right side of the tub and your left hand will be on the left side of the tub. This is how you choose the water ports and drain location to your needs. The ramp location will be on the opposite side of the water ports. Example: If you order right side water ports, the ramp will be on the left side. Floor grate made from heavy duty high density polyethylene plastic will not rust and provides a raised flooring to keep dogs feet out of the shampoo suds, water and debris. The floor grate is available with no hinges (one full piece) or a hinged grate, which makes it so easy to clean out your drain. The hinged grate is hinged in the middle. One side lifts up. 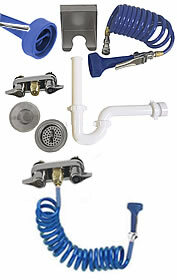 Much more convenient to keep your drain free of hair and debris. Designed for Stainless Steel Pet Tubs. Though it can be used with any pet tub.